We all know the tastebuds of a young child are geared towards the sweetness of breast milk--and that the chlorophyllic tang of a pea may take some getting used to, but what better time to start kids on a nutritional journey than while very, very young? I'm a strong advocate of starting the wholefood journey early, and, like all things in life, what better way to encourage poppets to do anything, than with a book? Kathryn Warren has self-published this gorgeous hardcover book with the aim of exciting children into nutrition, with a cast of cute veggie characters who parade and bound and ice skate across its pages, enticing little tastebuds to take a bite. Most self-published books suffer editing faults that give them the polish required to compete with trade-published books, and while Vegetabibbles does suffer this (in terms of grammar, rhythm and flow), its small faults are quickly downplayed by the book's vibrancy and joy. The book is very well-produced and supremely laid-out and designed, with delectable illustrations and typography. Featuring double-page spreads of various vitamin-packed characters, variant prose and rhyming text introduces us to their nutritional benefits. Quirky and lots of fun, this is a book kids will love exploring and scooting along with. Warren's use of super cool vocab and penchant for advanced words are warmly appreciated by this lover of language. Busting with colour and energy--and I'm not just talking about the veggies. 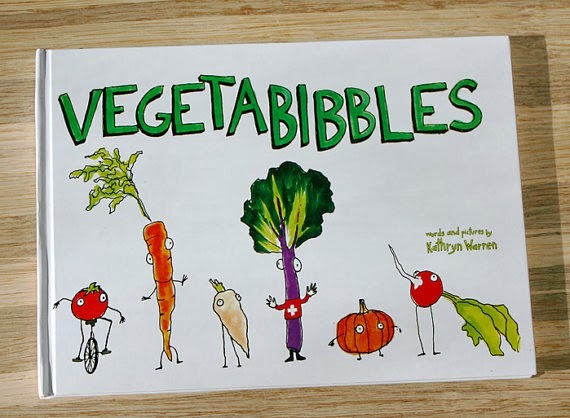 You can buy Vegetabibbles on etsy right here or see more on the book's facebook page. You could also try Amazon.